What Can Coins Tell Us About the Past? Numismatics, the study of coins, provides important information archaeologists and historians use to decipher the past. The images and writing on coins can prove useful in many different ways. For example, coins found at archaeological sites can help to establish the date of the site's occupation. Coins can also provide insight into the ideals and motivations of the government or ruler who minted the coins. This specific coin is attributed to Alexander the Great (lived 356-323 BC; ruled 336-323 BC), king of Macedonia and a great military general who succeeded in creating one of the largest empires of all time. This empire stretched from India and inner Afghanistan in the east to the Adriatic Sea in the west and from Egypt in the south to the Black Sea in the north. 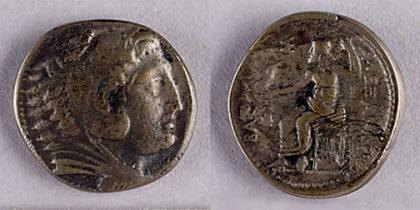 This silver tetradrachm coin was extremely common and was minted throughout Alexander's empire, both during his life and for at least a hundred years after his death. As a result, it is difficult to determine an exact date or mint location for this coin, but it is likely that it was minted between 336 and 290 BC somewhere in the Near East. The value of the tetradrachm was equal to four silver drachm coins, which were ancient Greek coins minted to a standard weight. meaning: reign of Alexander or the Kingdom of Alexander. As a great admirer of Greek culture, Alexander believed he was descended from the Greek mythological figure Heracles (Hercules), who was known for his strength and courage. After looking at this coin, one can see that Alexander is either trying to portray himself as Heracles or at least trying to emphasize his relationship to the mythological figure. This coin comes from a small collection of Roman, Greek, and Byzantine coins at the Science Museum of Minnesota. These coins are being identified through collaborative work with the Classics Department of Macalester College. Through this partnership, the coins will eventually be displayed in a student-designed exhibit, first at Macalester and then at the Science Museum.